I love Fall. The changing colors of the leaves, the crisp mornings, and the fellowship of holiday season. Our gifts to friends and family are usually small tins of baked yumminess, or a cookie variety plate. This year in our quest to add to the gifting repertoire I considered brittle. Hot sugar however requires a little extra minding than a mere oven timer. Please be careful if you have little ones in the house, or are attending to chores elsewhere – a boiling pot of sugar needs to be watched! You’ll also need a candy thermometer for this one. Let’s get cooking! Warm an oven to 200 degrees Fahrenheit. Prepare a baking pan lined with tin foil (and lightly butter). Place in oven. Into a pot add the hard cider down to cinnamon. Stir to combine and heat until 300 degrees Fahrenheit, which is Hard Crack stage. You will be tempted to stir this as it boils, DON’T. The sugar up the side of the pot crystallizes and can alter the consistency of your brittle. It probably took my pot about 30 mins to hit hard crack so be patient. As you get ready for Hard Crack to be reached on your candy thermometer, have the butter and baking soda standing by. Once the magic number is reached, swiftly remove the pan from the oven and set close by. Remove your pot from the burner and add the butter and baking soda to your pot. Stir quickly and thoroughly to incorporate. Add pistachios and stir – your mixture will be solidifying which is going to make spreading it in the pan difficult – hence the warm pan and your expeditious stirring skills! Pour the mixture onto the pan and quickly spread out as best as you can. This sugar will be VERY hot, please be careful. 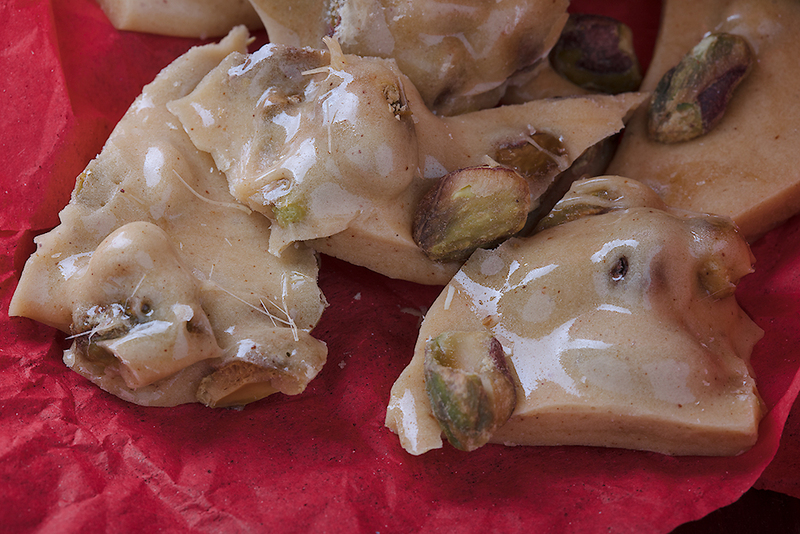 Sprinkle more pistachios on the top as you like. Set aside to cool. The pot and any utensils you used should be soaked in hot water to help you clean up.